The rapidly evolving Social Media software market is dominated by quite a few vendors, some of which offer full-stack Social Media management solutions (SMMS). The landscape also features some vendors which offer niche solutions that are geared towards more specific use cases as per buyer needs. Among the market leaders, differentials primarily reside in more specialized and advanced functionalities such as flexible APIs to allow integration to other platforms, automation across Social Media channels, streamlined publishing workflows to enhance content review functions, advertising functionalities, improved reporting on analytics, and compliance with security measures. 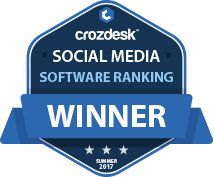 Overall, the Crozdesk Market Radar™ for Social Media software portrays a balanced market with a range of vendors in each sector including smaller vendors offering differentiated Social Media solutions. The table below compares the features of the top-ranked Social Media software products side-by-side. Social Media marketing budgets are steadily on the rise and software is crucial to get the most out of it. Below you can find the very best Social Media solutions for freelancers, startups, SMEs and mid-sized businesses in 2017. All applications are ranked by the smart Crozscore algorithm - taking into account large amounts of market data. The primary ranking factors are: general user satisfaction and usability, features and overall popularity. Additionally, you can find quotes from our in-house software experts below to get a better idea of each winner's offering. This ranking was published on July 26, 2017. 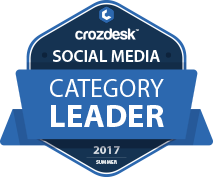 For the most up-to-date Crozscores, user reviews and other information have a look at the full Social Media product list.